In February 2017, a trial excavation was conducted at Kibbutz Ayelet Ha-Shahar (Permit No. A-7920; map ref. 254159–89/769669–96; Fig. 1), prior to enlarging the nursing home. 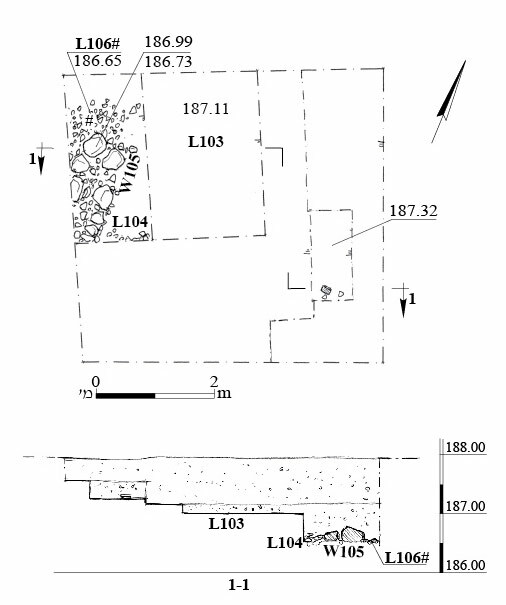 The excavation, undertaken on behalf of the Israel Antiquities Authority and financed by the kibbutz, was directed by A. Kleiner (photography), with the assistance of Y. Yaʽaqobi (administration), M. Kahan (surveying and drafting), H. Tahan-Rosen (drawing of finds), U. Berger (GPS), A. Shapiro (GIS) and laborers from Kafr Manda. Kibbutz Ayelet Ha-Shahar is located at the foot of Tel Hazor and is partly situated on the mound’s eastern spur. A number of archaeological excavations were previously carried out throughout the kibbutz. Part of a large public building (25 × 30 m), comprising at least six rooms, was exposed where the kibbutz’s dining hall currently stands (Fig. 1: Guy 1951; Kletter and Zwickel 2006); it was identified as Assyrian and was probably used until the Persian period. Building remains were exposed beneath the kibbutz’s cowsheds (Fig. 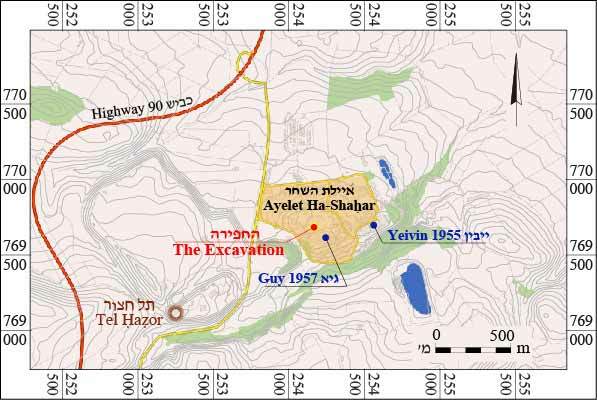 1: Yevin 1960; Yevin 1960); they included one structure thought to be a ninth century BCE inn and possibly part of the outlying neighborhood of the city of Hazor. 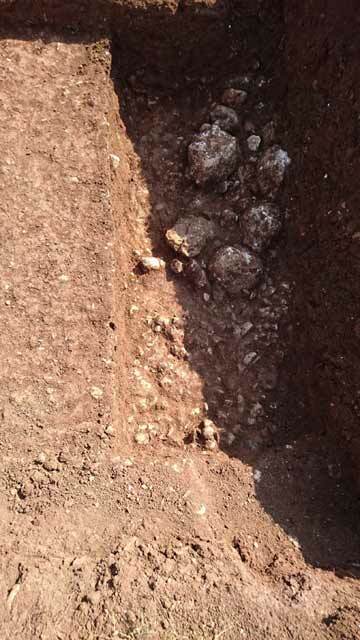 In the current excavation one square was opened north of the kibbutz dining hall, yielding two layers of finds (Fig. 2). Stratum II comprised wall remains built on a bed of river pebbles devoid of datable finds, and Stratum I comprised a fill of soil mixed with river pebbles and pottery sherds dating mostly to the Intermediate Bronze Age. The site was covered over at the end of the excavation. Stratum II. One course of a dry-constructed wall (W105; Fig. 3) of fieldstones was exposed. 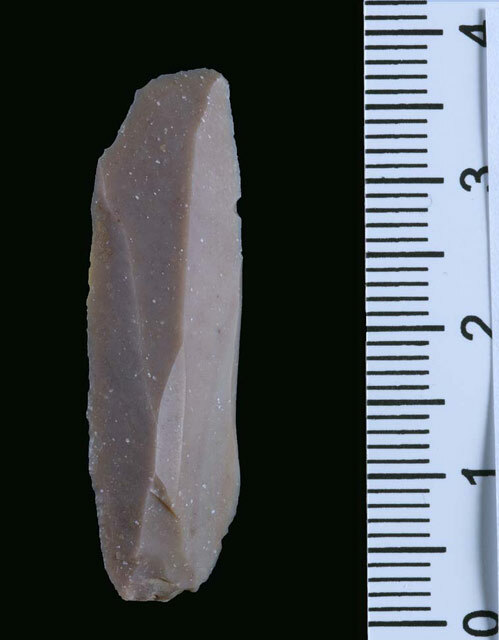 The wall, aligned in a north–south direction, was constructed atop a level of river pebbles (L106) that yielded a meager amount of finds: a flint bladelet dated to the Pre-Pottery Neolithic B period (Fig. 4) and several flakes that could not be dated with any certainty. The paucity of finds make it impossible to date W105. Stratum I yielded a layer of fill containing river pebbles and a few fragments of pottery vessels, some of which date from the Intermediate Bronze Age. 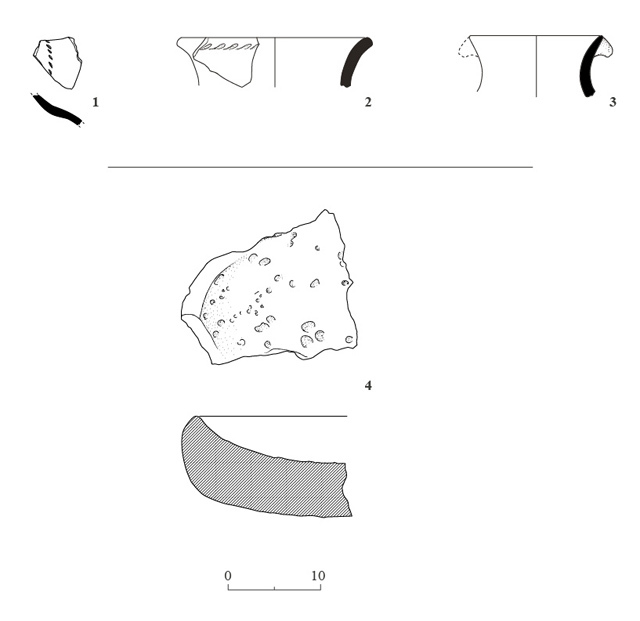 The sherds include fragments of a jar decorated with a half herringbone motif (Fig. 5:1, 2) and a jar fragment with a knob on its rim (Fig. 5:3). Part of a basalt grinding vessel (Fig. 5:4) was also found. The layer was not homogeneous in nature, and thus it is un likely that the potsherds it contained were in situ. Yeivin S. 1960. A Decade of Archaeology in Israel: 1948–1958 (Publications de l’Institut historique et archéologique néerlandais de Stamboul 8). Istanbul. 3. Wall 105, looking west. 4. A flint bladelet, Stratum II. 5. Pottery and stone vessels.